Figuring out how much stack usage an application has is difficult, but nevertheless critical on small embedded platforms with minimal RAM. 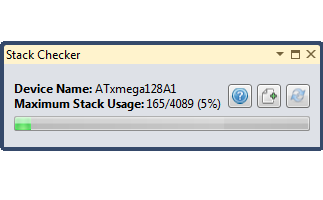 To aid in this quest, I build the Stack Checker extension for Atmel Studio, which provides a basic way to get the current maximum stack usage of the currently running debug session. Designed for AVR8 and XMEGA targets, the extension adds a small start-up function to your application which paints the stack area with a known canary value. When requested, the current RAM contents of the attached device is read, and the maximum stack usage determined from the portion of the stack space that differs from the initial painted sequence.